Blake's 7 Online - The Official Horizon Site - Discussion Forum: The Smilies! I just wanted to say how amazing the customised B7 smilies are on this forum!! Congrats to all who designed and did the technical jiggery pokery responsible! Unfortunately I don't seem to be able to include them in my post. Am I doing something wrong? 2. Click on the smiley you want. 3. It should appear where you left your cursor in the blue text box. If this doesn't work, it could be a browser issue. Make sure you don't have 'Disable Smileys in this Post' checked. Thank you GoldChannel! It was me who designed the smilies (several years ago now) and it's Website Mutoid who did the 'jiggery pokery' to get them working. I believe with the new forum software we can have a few more than we did previously. So keep a look out for some new ones and maybe a makover for some of the old ones. Orac, for example, is very difficult to see now on the light forum background and needs an update. Lorna, I'm not sure why you are unable to include them. You should just be able to select the one you want by clicking the smileys button (first on the left) under the text entry box. It should also be possible to enter them directly into your text by using the standard short cuts like : ) and ; ) (without the spaces between them). Also make sure you don't have the 'Disable Smilieys' option ticked, which you will also find under the text entry box. Feel free to use this thread to experiment if you want. I have noticed the smiley functions dont work with all browsers..
Chrome and Firefox seems to be okay. But IE 11 seems a little problematic. I'm assuming you're posting with IE Lorna.. can you try an alternate browser Lorna? Well caught PS! I use Chrome so didn't spot it. Lorna, you may want to consider changing to Chrome or Firefox browsers if possible. You might find you get a better internet experience all round if you do. Are you using IE11? If so, I would guess that Enhanced Protection Mode may be interfering with the BB code. Try manually typing : ) without the space between the two characters. Do you see a smilie in your post once it is published? Thanks WM, I will try this now Yes at least I can do that one!!! Here's a list of the symbols and letters used to make the smileys, with a gap between them. If you're on IE11 you can just type them (without the gap). However, I can't work out how to make Zen, how do you do a vertical line? Yes typing works, not sure the Enhanced Protection Mode is it, as on mine its off (I use Chrome/Firefox anyway) and smileys still don't work. Will check an earlier system, if may be a security issue but its not just EPM or if it is its a setting I haven't quite fathomed. Of course it could just be a bug! It wouldn't be the first time! SMILEYS DO WORK IN IE11!! 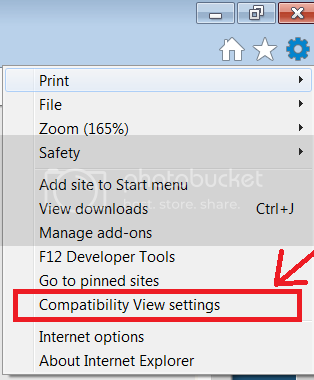 (personally I'd dump IE and usedChrome or Firefox) But if you want to keep your IE and you want the buttons to work try the following.. Locate the 'COG' wheel icon in the top right corner of the screen, click and access the following menu. type in the website name as shown! Thanks for that PS, it works! NB. 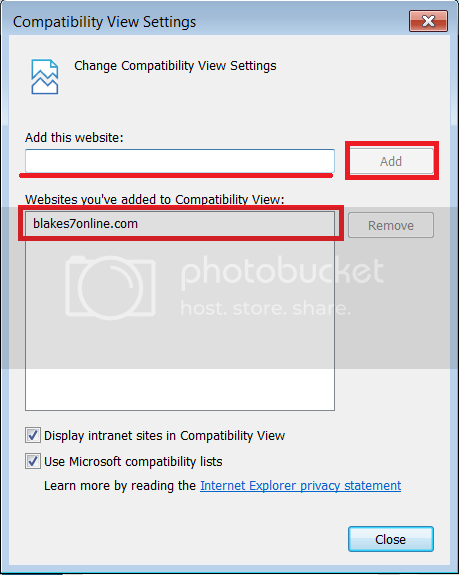 This tip has also been reported to fix various non appearing images and buttons on the Home Page..
On certain IE 10 systems.